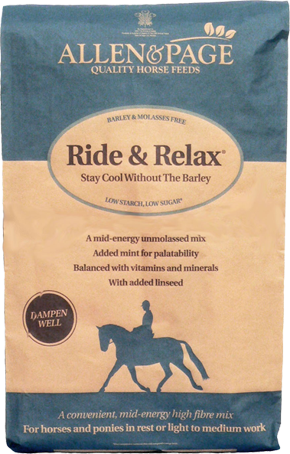 Ride & Relax is a palatable, light, museli mix for horses and ponies at rest or in light to medium work. Suitable for horses with an intolerance to barley or molasses, Ride & Relax is ideal for horses who tend to get excited on traditional low energy mixes. With added Omega 3 oils, Ride & Relax provides excellent sources of slow release energy and contains pre and probiotics to help maintain the balance of friendly bacteria in the gut. Dampen well before feeding. Introduce a new feed gradually over 7 to 10 days building up to the amounts needed to maintain condition and energy levels (0.5 – 6.75kg depending on size, type, workload and condition). Place feed in a shallow bucket, dampen well, then stir. Dampened, unmolassed chaff or soaked Fast Fibre can be added to the feed. This feed may not be suitable for laminitics – if your horse is prone to, or has, laminitis why not try Fast Fibre? Do not feed to sheep. 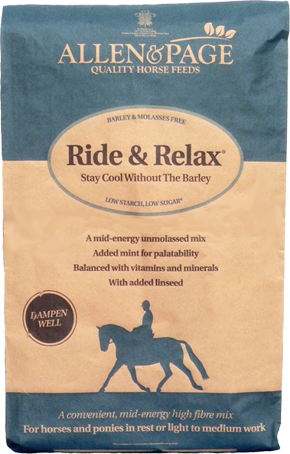 IMPORTANT, PLEASE READ: To get the best results from Ride & Relax, please make sure that you do not feed any other products that contain barley or molasses. Many traditional feeds contain barley & molasses which can cause excitability in some horses. Even horses that do not become fizzy as a result of these ingredients can benefit from a low starch and sugar feed such as Ride & Relax*.